Craving a fresh and easy summertime recipe? 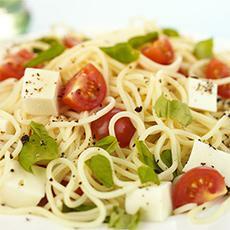 This Pasta Caprese is perfect! The ripest tomatoes, fresh basil, cubed mozzarella, and olive oil creates a fresh pasta sauce for whole-wheat thin spaghetti. Did you know that #cholesterol can be “good” and “bad”? What does cholesterol do and how can it affect your health? Every May, the Administration on Aging, part of the Administration for Community Living, leads our nation’s observance of Older American’s Month. The 2018 theme, Engage at Every Age, emphasizes that you are never too old (or young) to take part in activities that can enrich your physical, mental, and emotional well-being. It also celebrates the many ways in which older adults make a difference in our communities. Participating in activities that promote mental and physical wellness, offering your wisdom and experience to the next generation, seeking the mentorship of someone with more life experience than you—those are just a few examples of what being engaged can mean. No matter where you are in your life, there is no better time than now to start. We hope you will join in and Engage at Every Age! Use the materials, activities, and resources on this site to promote and celebrate #OAM18! Do you know how much calcium children need? More information on the trust and conference is available at https://agrilife.org/bennetttrust/ or by contacting Josh Blanek, AgriLife Extension agent in Tom Green County and event coordinator, at 325-659-6523 or j-blanek@tamu.edu. Looking to cool off from this hot summer heat? Try making our Cherry Vanilla Ice Cream for a cool treat! This article was in the Health Hints newsletter recently. It explains some important numbers for your heart health.